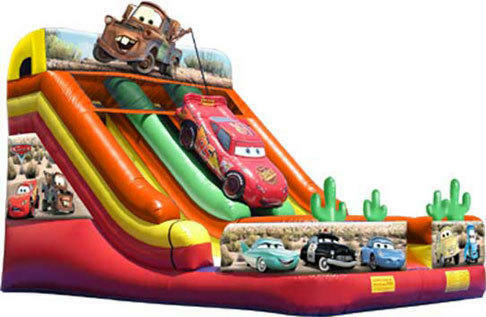 This licensed Cars Double Lane slide will bring fans from Carburetor Country running with a whimsical design and exciting two-slide option. Kids can climb up the center tunnel, which is topped off by a three-dimensional Lightening McQueen, and then choose from either a right- or left-sided slide for a speedy ride to the cushioned bottom. Mater, the fun-loving truck sits in artwork atop the dual-lane slide, while guests from Radiator Springs fill the bottom art panels, and 3D cacti flank the end of each racing-inspired dry slide. The Cars Double Lane dry slide is a great way to promote enjoyable and healthy activity, and will add excitement and value to any indoor or outdoor event! With a variety of colors, shapes and themes, the dry slides from Bay Area Jump offer kids of all ages endless amounts of aerobic activity. Our slides are made safe and secure with lite n strong™, fire-resistant vinyl making it safer, portable and more durable. Recommend 5 kids at a time, two sliding, two climbing and one entering. This slide must be staked or tied off for safety, otherwise water barrels must be ordered.